This week we welcome Stacy of Stacy Sews! She made a great version of the Flyer Cap for her son to get him through this winter that seems to go on and on! Hi! I’m Stacy. It’s not very often that my son asks me to sew something up for him, but when he does, how can I resist? 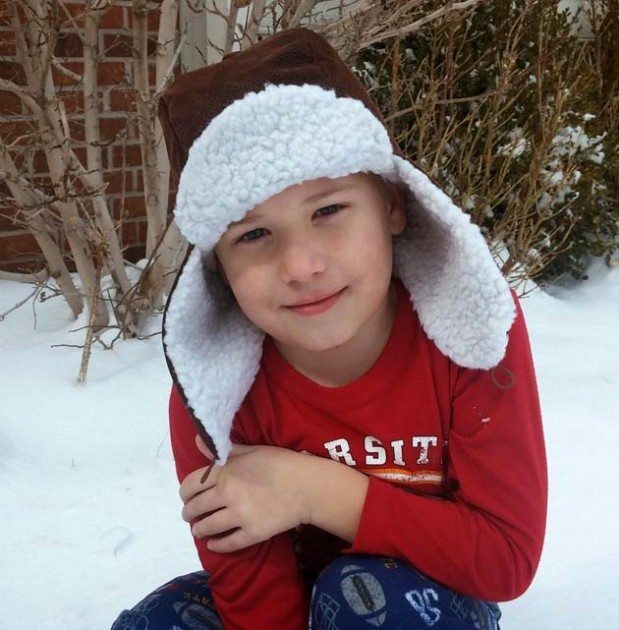 While going through the projects in Present Perfect, my son spied the Little Flyer cap and insisted he needed a ‘fuzzy’ one so that he could play in the snow. One thing that you may notice is that the sizing in the book is up to a 4T, but after measuring my son’s head, I was relieved to see that he could easily fit into the largest size without needing to add any adjustments to the pattern or seam allowances. After determining his size, I set to work making him one – aviator style. To give him a more ‘authentic Red Baron look’, I went with a faux leather exterior and a (faux) Sherpa fleece for the lining. Both materials had more heft and loft to them so I was able to omit adding interfacing and the batting to the hat… but this also meant there was more bulk. In comes my favorite notion, Wonder Clips! 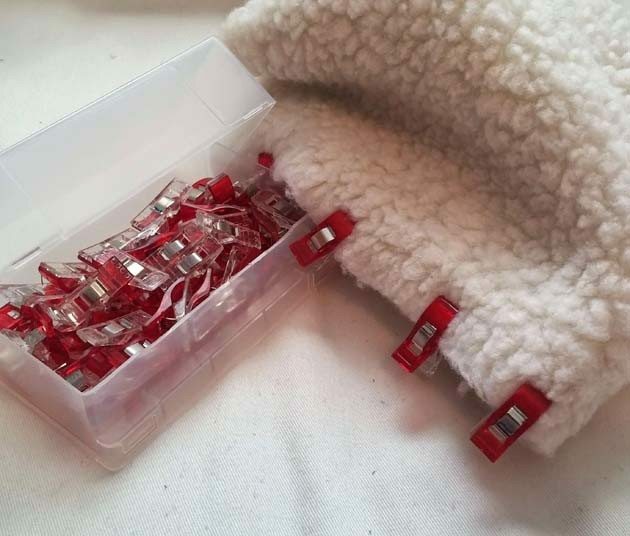 Using these replaces the need for pinning (not only can pins leave permanent holes in the leather, but can easily be buried in the thick Sherpa pile) and keeps bulky materials together while sewing. Since I didn’t use a batting, I omitted quilting the lining. Otherwise, I kept the construction of the Little Flyer hat the same as the instructions in the book. That is until I came to the section that addressed the elastic. I was afraid that ‘traditional’ elastic (usually white or black) would stand out too much against the darker leather, so I opted to use hair elastics instead. Not only were they close in width to those in the materials list, but they come in a huge array of colors! I found 100 in a variety of dark shades for just a dollar. I stitched these in the same as directed and they’ve stayed securely in place over numerous buttoning and unbuttonings. The best part of this project was that it was easily put together in no time. 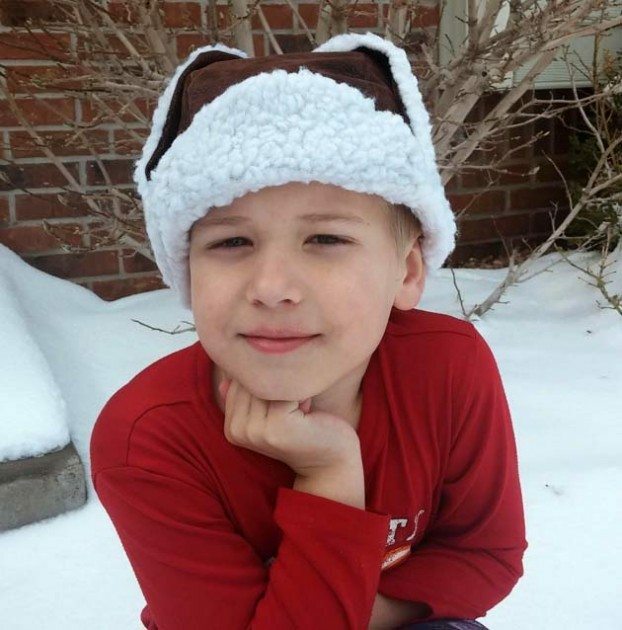 Before the morning was over, my son had a snuggly hat that not only fit great, but kept him warm during his romp in the snow… and the smile on his face when I handed him over his new hat was priceless. He looks happy with it! I think my boy his age would love a hat like that too!